Since the first ever Google search algorithm back in 1996, launched by 2 Stanford students who gleefully named it “BackRub”, Google has had a long history of famous search index changes and algorithm updates. Some are major, some are small. SEO specialists turn to publicly announced updates to help identify causes of traffic fluctuations or average SERP ranking movement and adjust their strategy accordingly. Updates to Google’s AI confirm these bots getting smarter and smarter by the day, all in an effort to always provide Google searchers with the best online experience. For business owners, this means your website must be updated, optimized, and professionally monitored for search engine success. Context is Key – Hummingbird was referred to as Google’s biggest update since 2010. Named after speed and precision, Hummingbird better identified context behind searches, commonly referred to as “search intent”. Before, algorithms matched keywords. “Best buy iphone” has a much different search intent than “buy iphone”. Searching Locally – Launched alongside Hummingbird, the Pigeon update emphasized the importance of users searching for services or businesses in their area – i.e. “pizza portland maine”. Local listings (the Google map and corresponding businesses populated) became a huge focus for businesses’ SEO strategies. Mobile is Here – In 2015, Google released a big announcement – this new (albeit unnamed) algorithm is designed to give mobile-friendly webpages a boost in SERPs. Thus, Mobilegeddon began – emphasizing the need for seamless design on mobile devices, where there is no need to have to “pinch and zoom” to read content. User Experience Matters – RankBrain closely measures how users interact with your website after they’ve entered from an organic search. It focuses mainly on session duration, or dwell time – how long users spend on your site. It also takes click-through-rate (CTR) into consideration – the percentage of users who see your webpage in a SERP and decide to click on it. A short dwell time and low CTR proves to Google that users don’t find your page too helpful, and will likely knock your page down in ranking. Mobile is Here (Seriously) – Despite the big mobile-first rollout in 2015, millions of websites still are not optimized for mobile devices in terms of both design and architecture. Studies show that over 53% of mobile users will abandon a site that takes longer than 3 seconds to load, but the average webpage loads in 22 seconds on mobile devices. This coming July, Google will place even larger emphasis on mobile responsiveness and mobile page speed. Knowing and continually learning about Google’s algorithm updates is a vital part of keeping a strong digital marketing strategy and staying ahead of the pack. Know when to make room in your budget for new content, technical tweaks, more advanced SEO, or even an entirely new website. It’s safe to say that Google is the leader of this game – and we’re all here to play it. 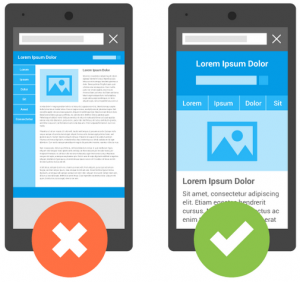 If your website is still not mobile-friendly, it’s not too late! Contact Vartuoso today to make the switch to a responsive WordPress website without the hassle (or breaking the bank).